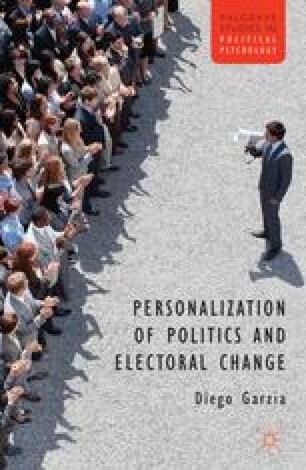 This book is about the determinants of voter choice in established parliamentary democracies. Unlike many existing studies, however, it will concentrate on the psychological drivers of voting. The decline of traditional social and ideological cleavages has, in fact, rendered progressively inadequate a purely sociological understanding of voting behavior (Blondel and Thiébault, 2010). Moreover, the long-term trends of secularization and enfranchisement of the working class in the Western world (Franklin, Mackie, and Valen, 1992) have been paralleled by the pervasive mediatization of the political scene and the resulting tendency to portray politics in an increasingly “personal” — rather than “partisan” — fashion (Garzia, 2011; McAllister, 2007). Taken together, these occurrences have all contributed to shaping the conventional wisdom that “election outcomes are now, more than at any time in the past, determined by voters’ assessments of party leaders” (Hayes and McAllister, 1997: p. 3).